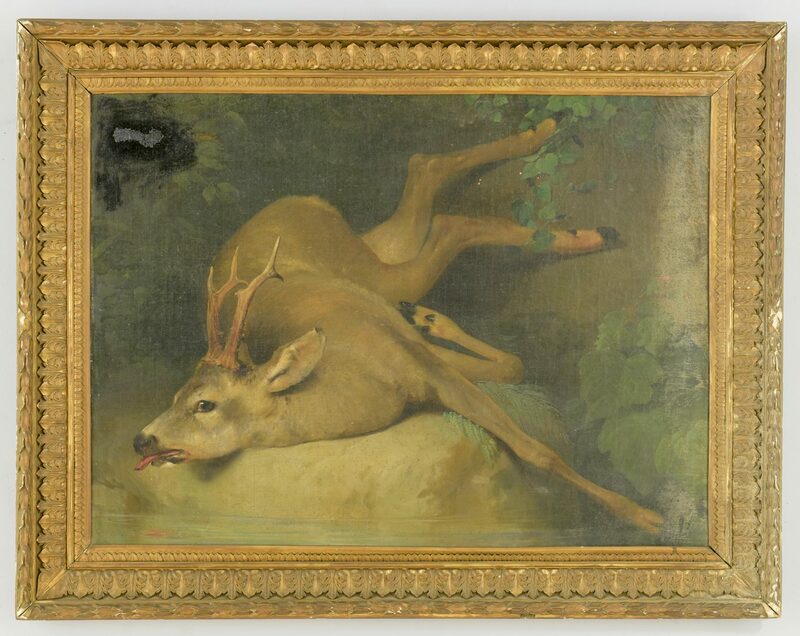 John Gadsby Chapman (American, 1808-1889) oil on canvas painting depicting a slain hart or deer on a rock, its eyes still open and tongue hanging out, left front leg barely touching a stream before it and foliage in the background. Image based on a stanza from "Hart-Leap Well" by William Wordsworth, first published in Lyrical Ballads, Volume II, 1800. Inscription of stanza from poem en verso. Housed in gilt carved frame. Sight – 28 3/4" H x 39 1/4" W. Framed – 37 3/4" H x 48 1/4" W. Provenance: The estate of Jean A. Yeatman and Harry C. Yeatman, formerly of Hamilton Place Plantation (near Columbia, Tennessee). Biography (courtesy The Johnson Collection): John Gadsby Chapman was born in Alexandria, Virginia. He studied with local artists George Cooke and Charles Bird King, at the Pennsylvania Academy of the Fine Arts, and in Europe, where he copied Old Masters and learned classic drafting techniques. Upon returning to America, Chapman became a landscape painter and portraitist, working in Alexandria, Washington DC, Richmond and Philadelphia. In 1834 he moved to New York and earned success as an illustrator and history painter. Perhaps his best known work is The Baptism of Pocahontas, a mural commissioned for the Rotunda in the U.S. Capitol and widely reproduced in period prints. In the 1840s, following the death of two of his young children, he and his family moved to Rome. Chapman remained there until 1884, painting scenes for the Grand Tour trade. HIs sons, Conrad Wise Chapman and John Linton Chapman, also became painters. Note: according to John F. McGuigan Jr., co-author (along with Mary K. McGuigan) of "John Gadsby Chapman: America's First Artist Etcher, " this work was likely painted by Chapman circa 1858 in Rome. 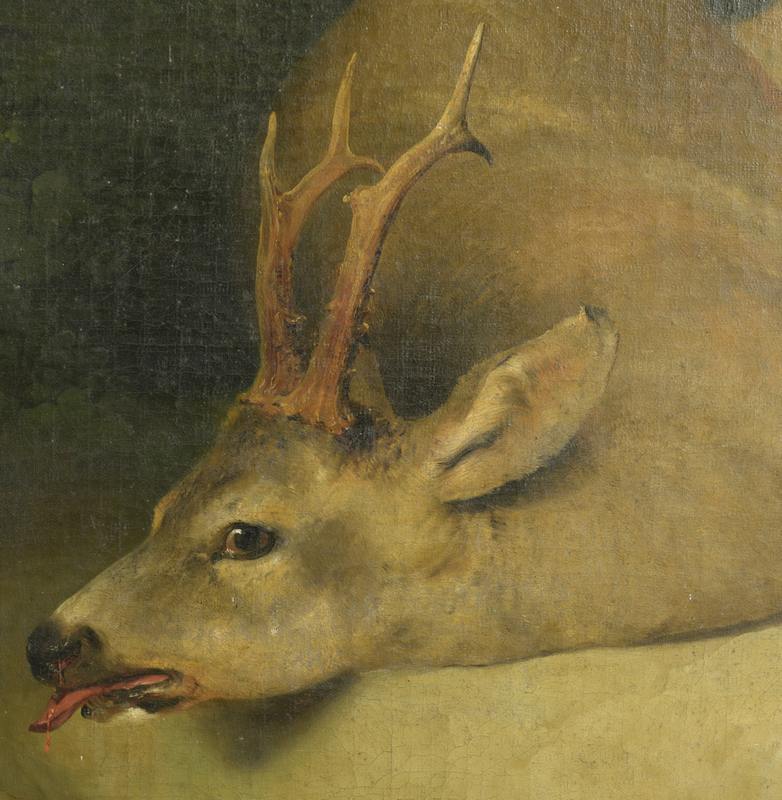 The subject of a slain deer appears in multiple works by Chapman, and was likely commissioned by the Yeatmans during a visit to his studio. 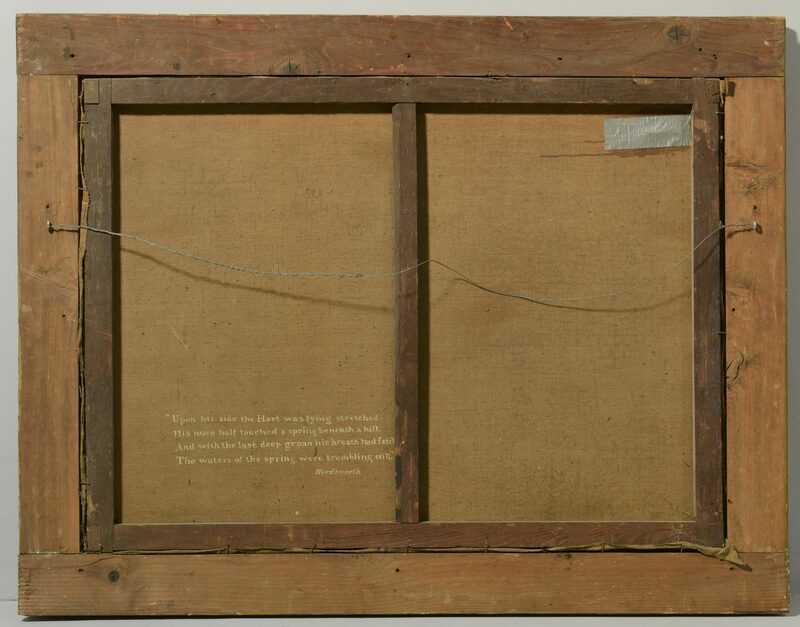 One of those works is referred to in an 1898 letter from John Linton Chapman to to Granville G. Valentine of Richmond, Virginia, stating " My father finished it at the request of his old friend William Cullen [Bryant] and called it the 'Hart Leap Well' after Wadsworths poem. How it happened is about as follows. 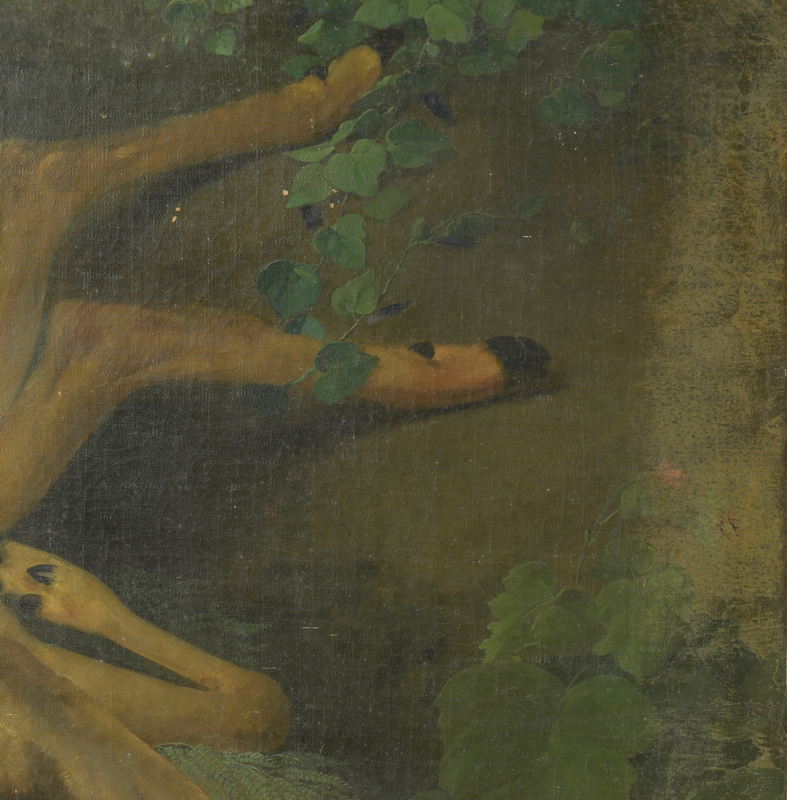 My father was engaged several years painting four large allegorical pictures of the four seasons – three months represented in each picture – as accessories to the figure representing September in the Autumn picture he introduced the Wild Boar, the Deer, and other game. 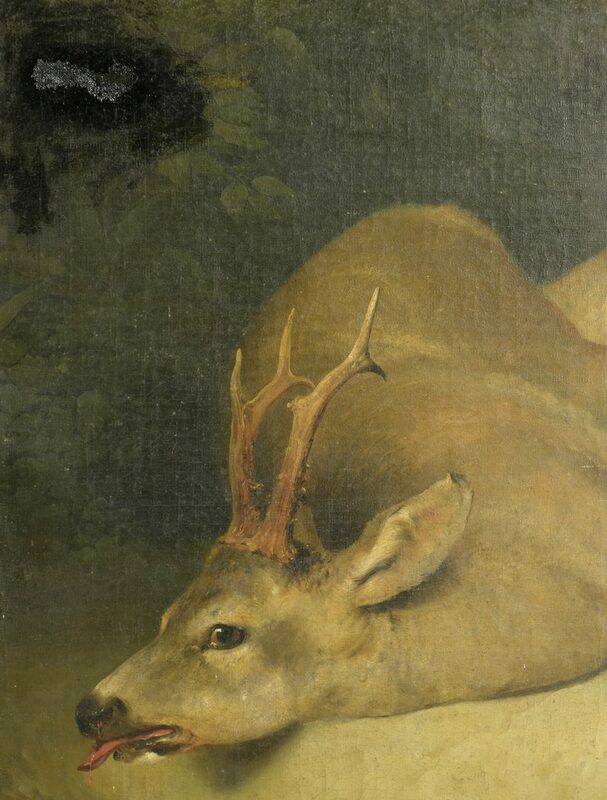 Being a hunter himself and a remarkable good shot, he hoped to be able to kill the Deer he required for the pictures, as he had already shot the Wild Boar and painted it. 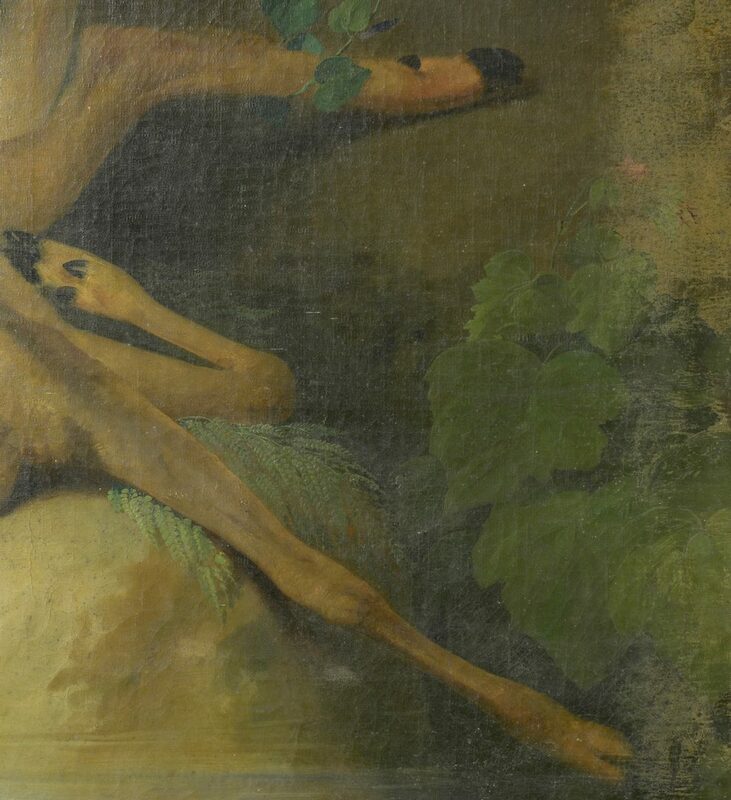 One morning as he was about starting to work at his easel, this beautiful specimen of the Roe Deer was sent in to him – having been killed a few hours before by one of his friends, an English sculptor – Holme Cardwell [18131895] a short distance from Rome. 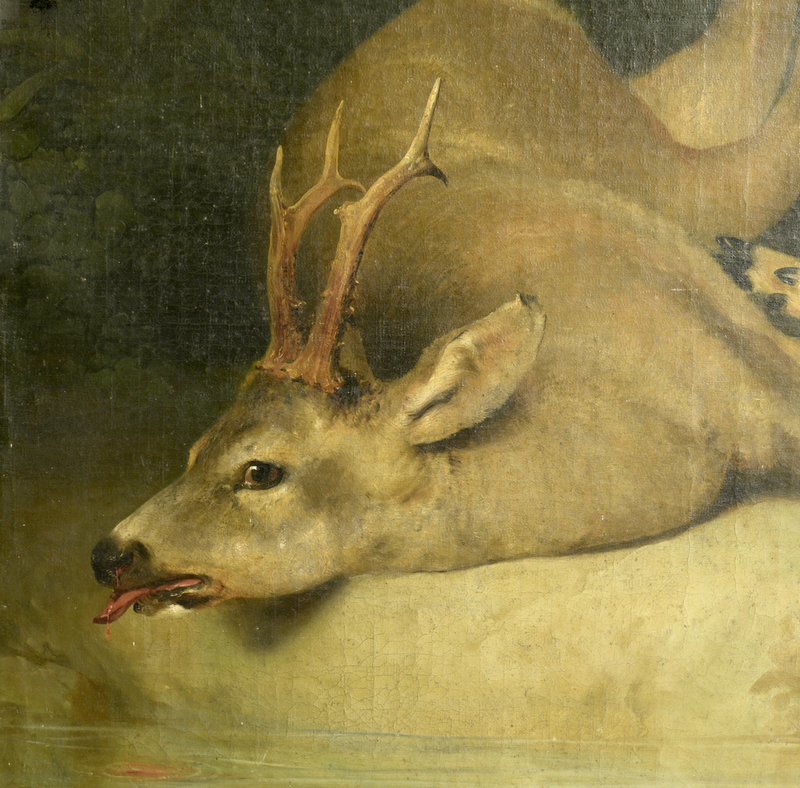 He at once placed the animal in the painting as he wanted it – and as it was yet warm – he set a basin of water under its mouth, from which the blood was still dripping. While at work at the study, William Cullen Bryant came in – as it was his habit to call to see my father every day. 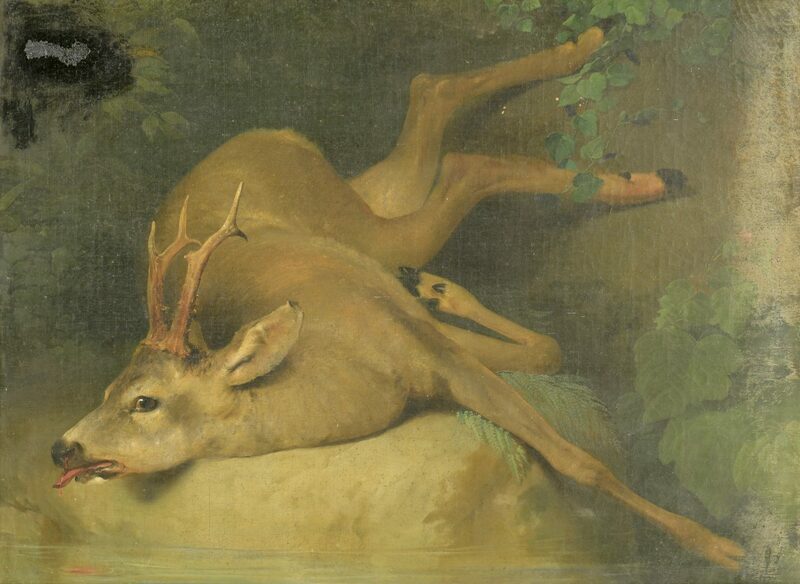 On seeing the Deer – its pose – the dripping blood – led him to exclaim 'Why Chapman, what a beautiful illustration you have of Wadsworths poem of the Hart Leap Well, ' quoting the poem, etc. Father finished the study as a picture, calling it The Hart Leap Well. " (Case wishes to thank John F. McGuigan Jr. and Mary K. McGuigan for this information). 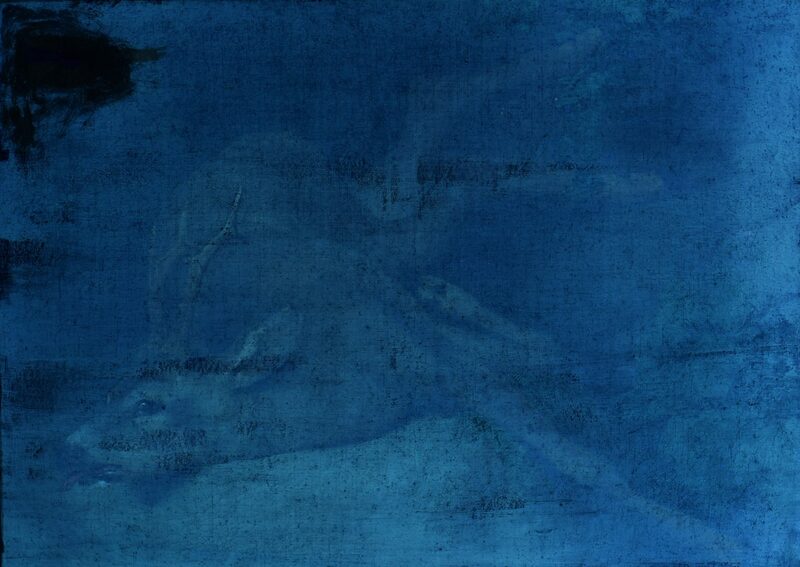 CONDITION: Craquelure on surface of canvas. Paint faded on right side. In-painting covers tear to canvas that was poorly repaired, top left.